Our fixed blade alternative to the popular 5.11 Tactical Karambit Folder, the Tactical Karambit Blade is also made with hardened AUS8 blade steel for superior strength and edge retention. Designed by world renowned knife use expert and instructor, Steve Tarani, this premium knife is 6.5” overall and 3/16” thick with an ergonomic grip and full size retention ring. The subdued charcoal oxide coating minimizes its signature in low light environments. 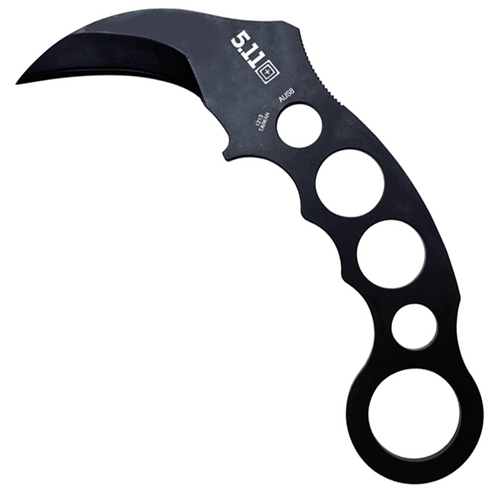 Includes a custom ambidextrous hard sheath that provides around-the-neck or inside-the-belt carry options.